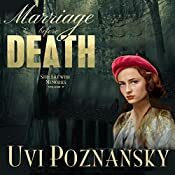 "A WW II sy thriller like no other"
Marriage before Death by Uvi Poznansky is a treasure, read alone or in its place in her series. We follow characters from her other books into a WWII milieu, with all the unparalleled darkness of those days. Poznansky's talent and resonance with the story means that you can read Marriage before Death on its own or as Book 5 in a series, following (Book 1: My Own Voice, Book 2: The White Piano, Book 3: The Music of Us, Book 4: Dancing with Air). Poznansky's protagonist Lenny, narrowly escapes execution, but not capture. Through his eyes and those of Natasha, who faces a more personal terror,a hideous fate, we are thrust into a world that not only breathes, but does so in a lyrical way that, somehow, brings the story closer, not farther away. If you haven't read Poznansky, Marriage before Death is a fine place to begin. Then, of course, you'll want to grab the others that came before. Brilliant.